During times of heightened stress, the body requires extra nutrition to repair itself and remain healthy. Each Defender Pack comes with 124 servings of our traditional GMO-free, easy-to prepare meals. In addition, we boost the available nutrition with organic grains and "super foods" (not synthetic vitamins, which are poorly absorbed and can be toxic). Now you can enjoy our classic chili and super charge it with organic quinoa. The Defender Nutritive Pack is a great way to prepare for your family's long-term well being. 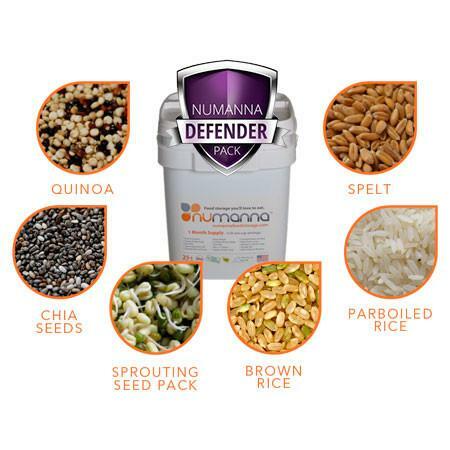 Our Defender Nutritive Pack includes 80 servings of each superfood. All super foods except parboiled rice are certified organic. Organic quinoa is considered one of the most nutritious foods in the world. It's the staple of many traditional cultures due to its extreme concentration of nutrients. Quinoa can be boiled, is gluten free, and it can be ground into flour. It mixes well with other foods. Quinoa is high in magnesium, manganese, iron, copper, phosphorous, complex proteins, and riboflavin. Organic black chia seeds sustained the Aztecs and Mayans, who considered it a survival food. It's been said that one tablespoon could sustain a warrior for a whole day. Organic black chia seeds are high in Omega-3 fatty acids, which are critical to heart health, and antioxidants, which protect the body from cellular damage. They can be stored for long periods without spoiling. Unlike flax, chia seeds don't need to be ground to release their nutrients. They're a superior source of fiber, calcium, phosphorus, magnesium, manganese, copper, iron, molybdenum, niacin, and zinc. Organic sprouted seeds: Sprouting removes anti nutrients that inhibit your body's absorption. Like chia seeds, a spoonful of sprouted seeds is enough to suffuse your body with nutrition. Seeds are nature's own perfect packaging, so, they store very well. While all foods are subject to some nutrient loss, sprouting can increase their bioavailability, which means nutrients are converted into an active form that your body can use to maintain health and wellness. Organic brown jasmine rice: Brown rice retains the outer bran and germ, which are rich in vitamins, minerals, fiber and essential fatty acids. Brown rice is rich in manganese, and the oil found in brown-rice bran has also been shown lower harmful cholesterol. Parboiled rice: Because it is already partially cooked, it's extremely easy to prepare. The Defender Pack includes parboiled rice as a fast and extremely flexible staple to mix with existing meals to increase calorie count, nutrition and overall servings. Parboiled Rice is an important addition to your overall preparedness because it helps ensure adequate caloric intake. Organic spelt is one of the first grains to be used to make bread, which is the "staff of life." Spelt (a close relative of wheat) has been a global staple food since the beginning of recorded history. It provides a broader range of nutrients than wheat, including manganese, vitamin B2, niacin, thiamin and copper. Spelt is particularly heart-healthy and cardio protective. It can reduce harmful cholesterol and is more digestible than wheat. Spelt can be great addition to an overall well-rounded and healthy natural diet.